It’s hard to believe now, but prior to the 1970s, the concept of the luxury sports watch didn’t exist. Rather, fine timepieces were typically restrained gold numbers on leather straps or steel tool watches such as diving watches. 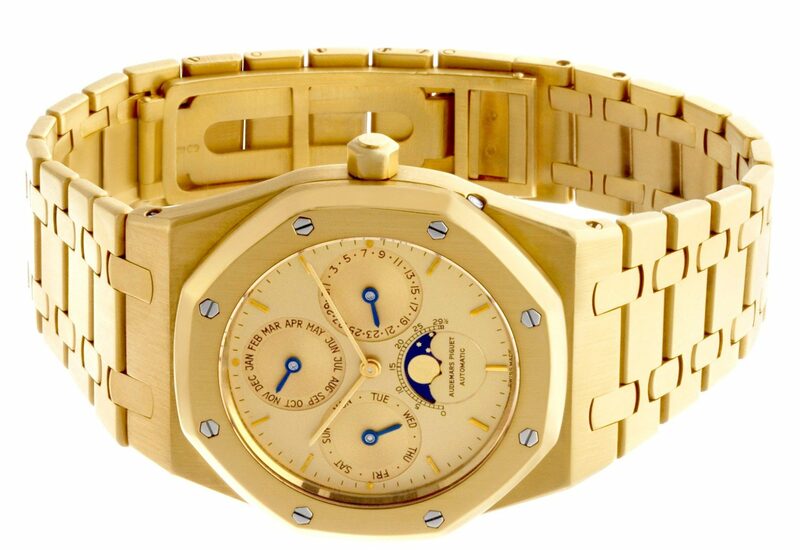 This all changed in 1972 with the debut of the Gerald Genta designed Audemars Piguet Royal Oak. With its octagonal bezel, steel construction, and integrated bracelet, not only did the Royal Oak go on to become globally famous, it also laid the foundation for the now-booming luxury sports watch category. Along with Royal Oak, let’s take a look at some famous luxury sports watches with integrated bracelets. When Audemars Piguet unveiled the inaugural Royal Oak in 1972, its design was indeed revolutionary to the luxury watch space. While it only offered time and date functionality, the Royal Oak stood out for its aggressive and unique design. According to Gerald Genta himself, the inspiration for the octagonal bezel with eight hexagonal screws was an old-style diving helmet. Along with the distinct case, another key design element of the Royal Oak is its integrated bracelet. The famous Royal Oak bracelet may seem simple at the outset but is in actuality, very complex to manufacture. Over the next 45 years, Audemars Piguet has added a wide assortment of Royal Oak models in different materials and sizes in addition to a variety of complications. 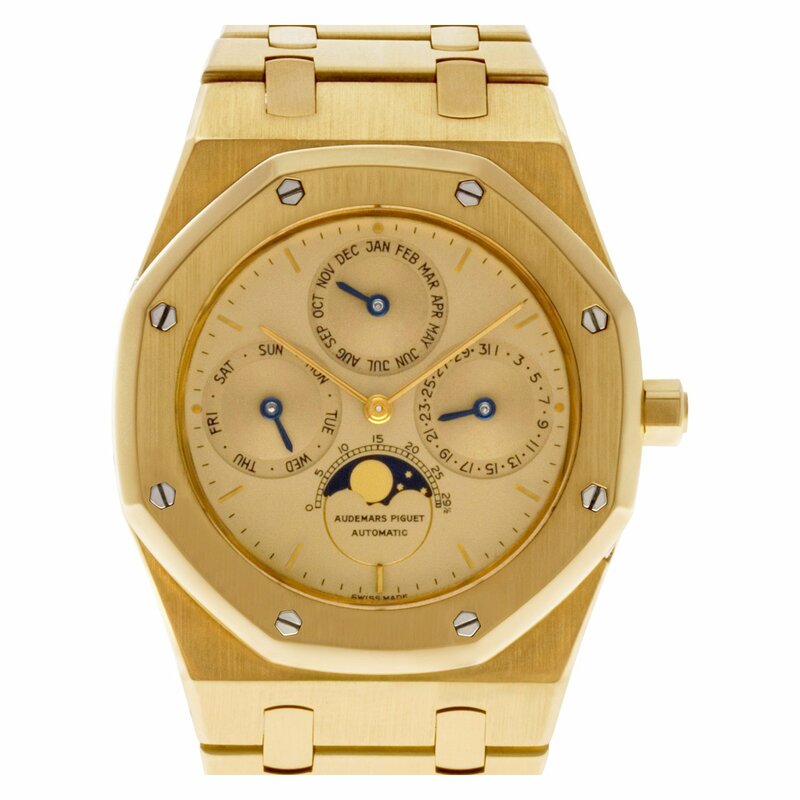 Take for example this 18k yellow gold Royal Oak Perpetual Calendar. Not only does it boast solid 18k yellow gold construction, it’s also equipped with the super practical perpetual calendar function. Able to correctly indicate the time, day, date, month, and moonphase almost in perpetuity–until the year 2100 when the leap year will be ignored–a perpetual calendar complication is one of the most difficult and sought-after watch functions in luxury watches. A few years after the release of the AP Royal Oak, Patek Philippe followed up with their own luxury sports watch with an integrated bracelet–the Nautilus. It was 1976 when Patek Philippe unveiled the Nautilus and it too was designed by Gerald Genta. However, this time, the designer took design cues from a ship’s porthole. From the rounded eight-sided bezel down to the hinge on the side of the watch case., the design of the Nautilus is instantly recognizable. Again, just like the RO, the inaugural Patek Nautilus was a full stainless steel version and only included time and date functionality. Furthermore, it also sported the Gerald Genta’s signature integrated bracelet. A key collection in Patek Philippe’s lineup, there have been countless versions of the Nautilus since its introduction. For instance, this Patek Philippe Nautilus ref. 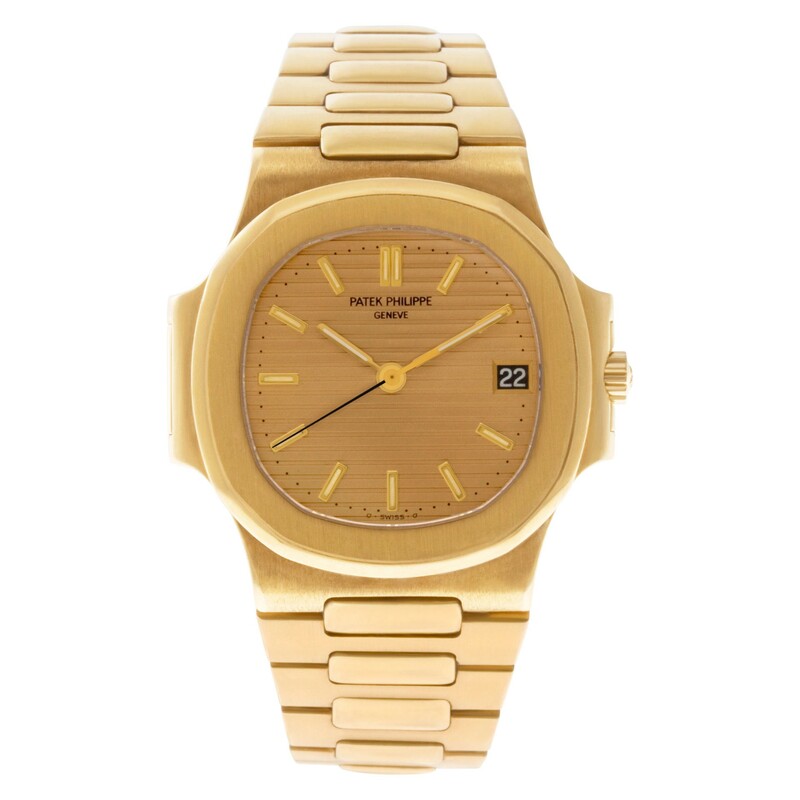 3800/1J from the early 1990s features a full 18k yellow gold case and integrated bracelet. On the dial, we see the characteristic horizontal grooves playing background to the simple stick hour markers, center hands, and discreet date window. In 1977, Vacheron Constantin released their own version of a luxury sports watch with an integrated bracelet with the 222. Rather than Gerald Genta, it was, in fact, his apprentice, Jorg Hysek, who designed the 222. The Vacheron Constantin had a similar aesthetic to the Royal Oak and the Nautilus including an angular case, bold bezel, and integrated bracelet. Yet again, the first 222 was made entirely of stainless steel and with its time and date features, was straightforward in functionality. 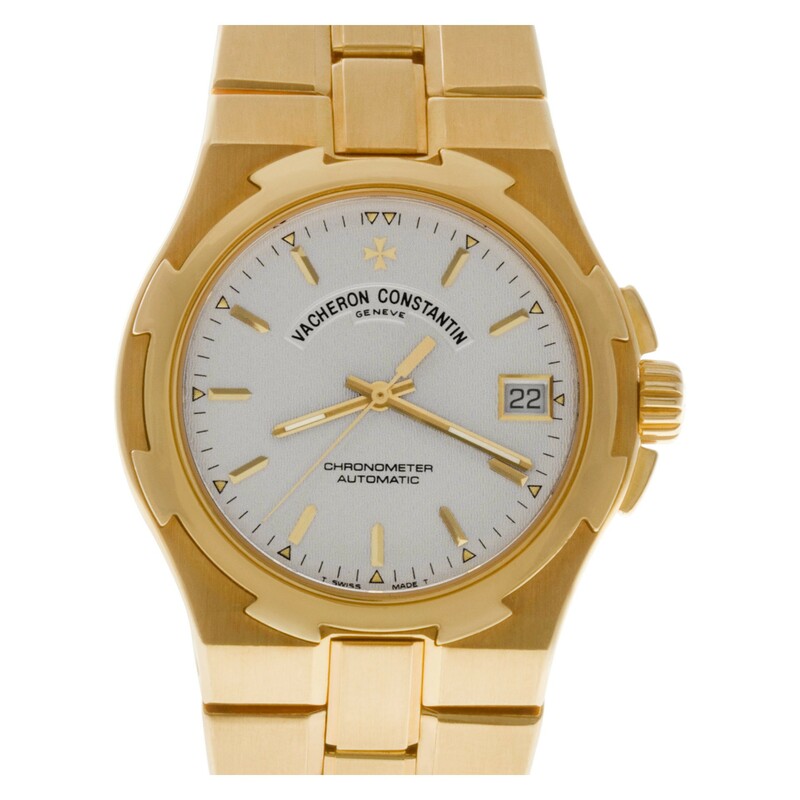 Vacheron Constantin eventually discontinued the 222 collection in the 1980s. However, the brand brought back their luxury sports watch collection in 1996 and dubbed it the Overseas. As a direct descendant of the 222, the Vacheron Constantin Overseas retained many design traits of its predecessor. These included an angular case, bold bezel, and of course, the integrated bracelet. Looking at this 18k yellow gold Overseas ref. 42042, we see that the shape of the fluted bezel cleverly mimics the ends of the Maltese Cross–Vacheron’s logo. The white dial houses matching 18k yellow gold faceted hour markers and center hands, in addition, to a date aperture. It’s interesting to note that the above three brands, Audemars Piguet, Patek Philippe, and Vacheron Constantin, make up the “Holy Trinity” of the luxury watch world. Their luxury watches with integrated bracelets were a drastic departure from the traditional timepieces that made these watchmakers famous. However, since the 1970s, not only did these luxury sports watches add another facet to the offerings of their respective brands, but the Royal Oak, Nautilus, and Overseas became icons in their own right.